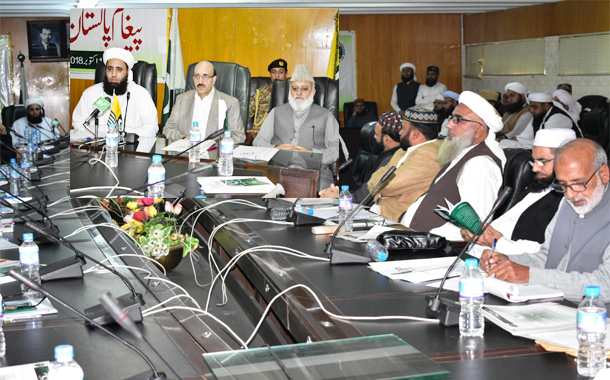 MUZAFFARABAD: Sardar Masood Khan, president of Azad Jammu and Kashmir urged the religious leaders to play their role to rid the country of the violent extremism by spreading the true message of Islam. Speaking at ‘Paigham Pakistan Conference’ organizing by Ulema and Mushaikh here on Wednesday, Sardar Masood Khan said Islam is universal religion and Prophet (PBUH) was sent to all peoples of the world, regardless of their race, colour, culture and geographical location. “Islam’s universality makes it a religion that is acceptable to all people in this world and that was the very reason that over one billion human being are now in the fold of this true religion,” President Masood said. Describing peace, tranquility, mercy and compassion as foundations of the religion of Islam, the president called upon the Ulema and religious scholars to demonstrate respect to all human beings to create a space for further expansion of their religion. Terming tendencies of violent extremism and radicalization in the country as a serious challenge for the nation, he said our enemies on one hand want to destabilize Pakistan by dividing us in different sects and groups and on the other they are attempting to deprive the people of Pakistan from the basic ideology of Pakistan. He said that people of Pakistan, particularly Ulema and Mushaikh are united and they would never allow anti Islam and anti-Pakistan forces to materialize their evil designs. Urging religious scholars and intellectuals to promote the true teachings of Quran and Sunnah, President Masood said that rivalries on the basis of petty and insignificant differences among the followers of different sects is detrimental to the social fabric of our society. Describing the declaration of Paigham Pakistan (Message of Pakistan) signed by the religious scholars from all schools of thought as right step at right time, President Masood commended the efforts of Ulema and Mushaikh for bringing and maintaining peace and harmony in the society. Explaining the salient points of Message of Pakistan Masood said since Pakistan constitutionally is Islamic Republic after inclusion of Objective Resolutions in the constitution, there is no justification of use of force or wage an armed struggle against the state of Pakistan to impose Shariah in the country. The declaration, he added unanimously rejects extremist ideology and extremism in all forms and manifestations, considering it as an evil ideology with consensus of the Ulema that spreading sectarian hatred, armed sectarian conflict and imposition of one’s religious ideologies by force are contrary to the teachings of Islam. The President further explained that declaration of jihad involving physical combat and waging war is the prerogative of the state, and no individual or group has the authority to declare and wage jihad. Any group or individual that initiates such actions will be transgressing the state authority. Paying tributes to armed forces of the country for fighting extremism and terrorism, President Masood said our valiant forces offered matchless sacrifices to rid Pakistan of the menace to provide stability to the country. He said entire nation and Ulemas of all sects acknowledge this and announced strong support for ongoing military operation Radd-ul-Fasaad, that is initiated to strengthen the security and stability of the country.